We met him while travelling in Rarotonga, on the Cook Islands off the coast of New Zealand. Douglas Tetupuariki, of Aunty Pat’s Coco Candy is, indeed, “The Best Sales Person in the World”. The reasons for the moniker “Best Sales Person” is not because he sells a lot (although I believe he does very well), not because he runs a multi-million dollar company (he might, I don’t know), and not because we bought from him (which we did). I call him ‘The Best” because he naturally does what so many do not. He is curious, caring and connected with people. And, he happens to sell a ton of product! We met Doug our first night in Rarotonga. 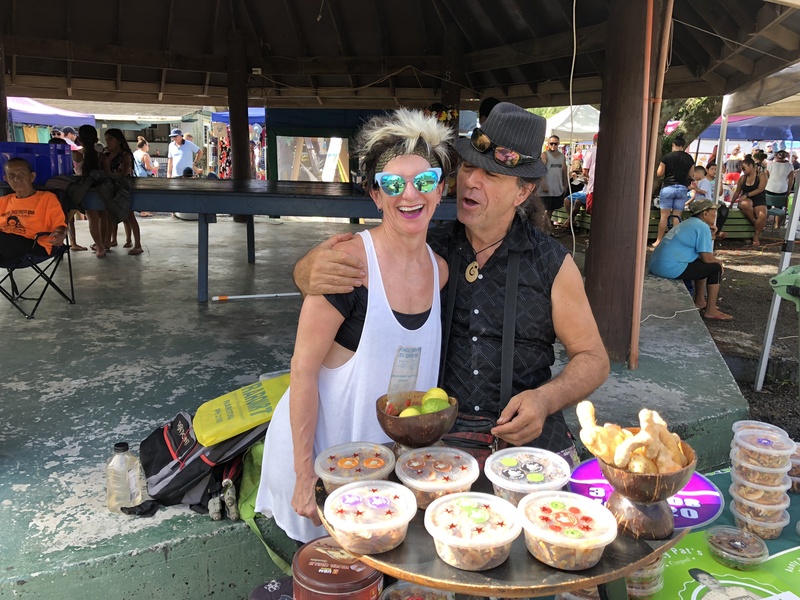 He immediately connected with us – he was curious about who we were (even though the market was full of other tourists), and he cared about what we said (which he showed by looking right into our eyes and responding as though he was really listening). Since we had just arrived, we did not buy from him immediately. On our way out, we walked past him, and he again connected with us in his enthusiastic, warm and welcoming way…and we bought from him. He was irresistible. A few days later, we saw Doug again at another market. Immediately, he greeted us like we were old friends. He noted that he saw us biking to the market, and he complimented us for choosing a healthy mode of transportation. He remembered what we said about ourselves from days before (even though his stand was swarming with other potential customers). He remained curious, caring and connected; even though he did not HAVE TO – he already had the sale. I thought about what separated Doug from all of the other vendors. No doubt, he has incredible interpersonal skills. However, there was something else. Doug actually WANTS to connect. He WANTS to know about the people who come by his Coco Candy stand. He WANTS to show you that he cares about you by paying attention to you, and remembering you. Do you want to make more sales? Whether you are selling a product, service, idea, or yourself in an employment interview or as a prospective dating companion … choose to be curious, caring and connected with people around you. I think you will find the results you desire will effortlessly appear…they won’t be able to resist you! Wow Deri, I absolutely love this idea. I try to be positive but I believe my ability to care perhaps does not always come across. I am naturally curious about people but I do not think I necessarily get or stay connected to people. I’m sure I can put more effort into this style of communication. Thank you so very much for this communication. I truly appreciate your time and connection. Thank you so much for the comment, Muriel! I love the insight you show into yourself! I appreciate your time and connection also, Muriel!